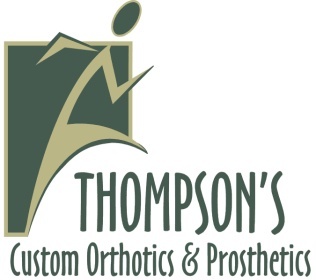 Here at Thompson’s, we do a variety of different types of Prosthesis including Cosmetic, Functional Body Powered Prostheses and Myoelectric Prosthesis. Cosmetic Prosthesis has long been used to disguise injuries and disfigurements. With advances in modern technology, cosmesis, the creation of lifelike limbs made from silicone or PVC has been made possible. Such prosthetics, such as artificial hands, can now be made to mimic the appearance of real hands, complete with freckles, veins, hair, fingerprints and even tattoos. Functional Body Powered Prosthetics are the more basic type of prosthesis utilizing cables and straps to open and close a prosthetic hand or hook through the use of the patients own strength. A Myoelectric Prosthesis uses electromyography signals or potentials from voluntarily contracted muscles within a person's residual limb on the surface of the skin to control the movements of the prosthesis, such as elbow flexion/extension, wrist supination/pronation (rotation) or hand opening/closing of the fingers. A prosthesis of this type utilizes the residual neuro-muscular system of the human body to control the functions of an electric powered prosthetic hand, wrist or elbow.